Two Dark Judgement comics, published by Futurequake and written by Richard McAuliffe with art by Conor Boyle, are now available free to download in a pdf format. The comics are one of several examples of a special arrangement allowing Zarjaz (2000 AD Fanzine) through Futurequake to publish comics featuring characters belonging to Rebellion, who own 2000AD. I've also included the file here on Planet K, so if you can no longer obtain this file from the above link then you can get it from my download section, although it means registering with the site as my downloads section isn't open to the public due to bandwidth restrictions. Mark Simpson, known by the pen name Jock, draws Batman in a speeded up film which was cut from the BBC TV show 'The One Show' which recently aired an episode which had an article about comics. This month of February 2011 the Galaxy's greatest comic celebrates 35 years of thrill power. The weekly science fiction comic has provided superb entertainment and has matured over the years, maintaining humorous well written stories with fantastic artwork, including titles such as Judge Dredd, Halo Jones, Skizz, Strontium Dog, Rogue Trooper and Slaine to name but a few of my favourites. An English icon that looms large in it's own legend, life just wouldn't have been the same without it. Forget the reigns of mortal monarchs or gargantuan gatherings to witness your feeble athletic attempts – there’s only ONE event in 2012 worth celebrating! 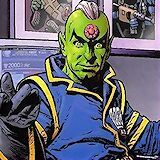 We’re kicking off a month of festivities to mark the 35th year since Tharg the Mighty himself bestowed Thrill-power upon Earthlets everywhere! Yes, 2000 AD is 35 years old this month! With the official 2000 AD 35th birthday party coming up this weekend at the sold-out SFX Weekender in Prestatyn, we’re officially kicking things off by revealing one of the TWO zarjaz covers that will be gracing the anniversary prog – first up is this beauty by legendary art droid Chris Weston! 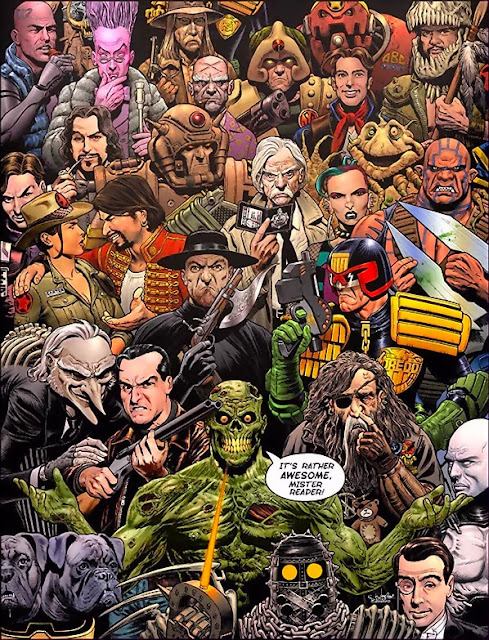 This cornucopia of characters brings Brian Bolland’s classic cover, used on the front of 2000 AD history title Thrillpower Overload, bang up to date with Defoe, Zombo, Stickleback, Shakara, Absalom and Dirty Frank amongst many others. The bumper 48-page Prog 1771 goes on sale 22 February with a choice of two variant covers, a FREE bagged special gift and a truly galaxy-spinning line-up! Things kick off with continuing thrills ‘Judge Dredd: Eve of Destruction’ by John Wagner and Ben Willsher, and ‘Nikolai Dante: The Wedding of Jena Makarov’ by Robbie Morrison and Simon Fraser. Then there’s the last episodes of ‘Strontium Dog: The Project’ by John Wagner and Carlos Ezquerra and ‘Absalom: Ghosts of London’ by Gordon Rennie and Tiernen Trevallion, as well as a new Grey Area story – ‘Personal Space’ – by Dan Abnett and Lee Carter. And then there’s two very special tales exclusive to this issue: the amazing creative pairings of Andy Diggle and Colin Wilson plus Pat Mills and Henry Flint present ‘What if...?’ – the 2000 AD multiverse is infinite, Earthlets, so prepare to be blown away by these flights of incredible fancy! So join us this month as we celebrate three and a half scrotnig Thrill-powered decades!